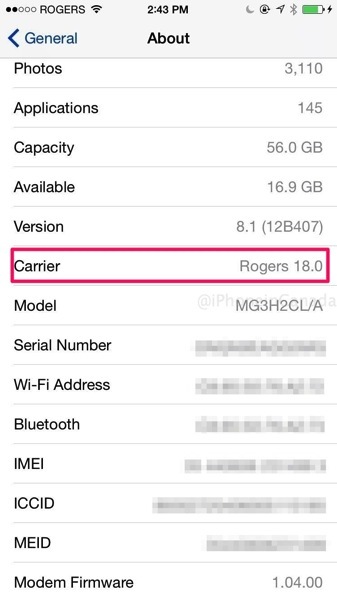 Rogers has pushed out their 18.0 carrier settings update for iPhone users, for those on iOS 8.1 beta 2. There’s no word what changes this latest update brings, but most likely it includes network optimizations for iOS, as we’ve seen in the past. iPhoneinCanada.ca reader crosseyedmofo says after this update was installed on iOS 8.1 beta 2, he is seeing “speeds that have doubled for me on LTE” on his iPhone 6 Plus. We’ve reached out to Rogers for clarification on this update and will update this post accordingly. Let us know if you’re seeing this 18.0 update and whether you are noticing any changes. Update: Looks like this is only pushing out for those on iOS 8.1 beta 2, as suspected.